The folks at Wellington, NZ ad agency ClemengerBBDO have gotten together with the pubs of Craft Beer Capital and craft breweries Parrotdog, Tuatara, Garage Project and Yeastie Boys (best name ever) to try to capture the spirit of the New Zealand capital in the ‘Wellington in a Pint’ campaign. 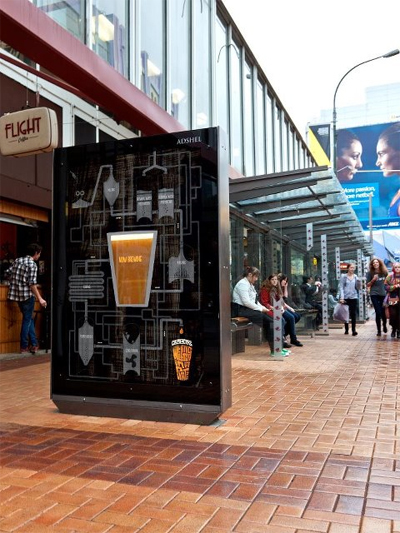 As part of the campaign, Anderson Design created a special shelter on Manners Street, in which they placed a special 30 litre tank (with UV coating to protect it from the sun, and heating pads to protect it from cold) of wort to ferment. In the photo album caption they admit, “it probably won’t taste very good, so we’re calling it Bad Manners”. Round 1 began in April, and participants were asked to submit their creative idea desrcibing Wellington would be via the website or on the back of special beer-mats. A few of the more colorful examples include “”Bohemian Armpit – flavoured with a hint of cumin and patchouli”, “Courtenay’s Tears – a youthful beer best drunk on a Friday” or “Black Umbrella – dark and blows you away”. Round 3 will see craft breweries Parrotdog, Tuatara, Garage Project and Yeastie Boys selecting one each of the winning beers, refine it and turn it into a professional craft beer for the beer-loving masses. On June 27 the beers will be released to the thirsty public in Wellington, and yes, I just went and checked on flights to New Zealand ($2400 return from Toronto). The campaign is brilliantly supported by social media, including a Facebook page, Twitter profile, Google Maps and Foursquare tip list.